During the talks at the beginning, the fire fighters discussion about integrating mobile devices with first responders inspired our project. One of our team members is training to be an EMT and discussed the tedious task that all EMT's have to do of hand writing a Patient Care Report every time they arrive to aid an individual. Our idea was to create something that could aid first responders and make their jobs easier. 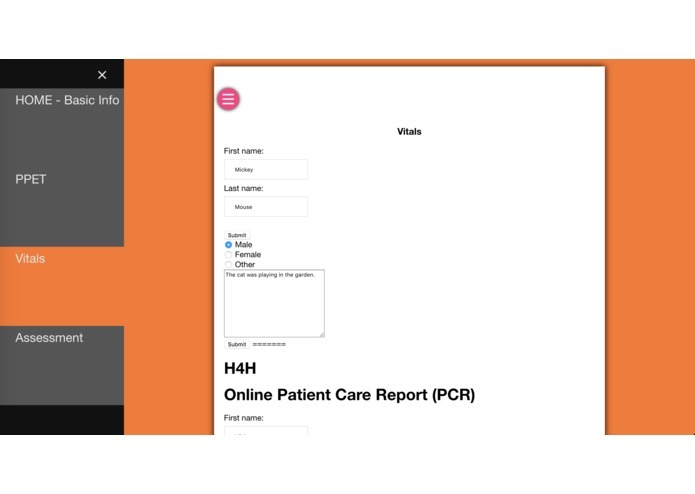 Since a PCR is something that every EMT has to do, we figured having a standard online form that they could easily fill out would simplify the job and allow the responder to spend more time focusing on the patient and their needs. We utilized Github, Tele-Atom, Mamp, textwrangler and sublime to edit and collaborate across team members. Though our site consists of the bare bones, we are proud of our UI, and the database that we created form scratch. Furthermore, though creating a pdf was extremely difficult, in the end we were able to figure out a way for it all to come together and work. We want to integrate our database with our online form so that the auto save function works. Furthermore we would like to polish up the website and make the form more extensive.